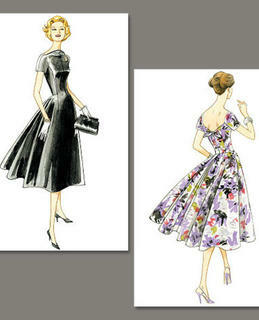 MISSES’ DRESS: Close-fitting, lined, floor length dress has pleated front bodice, raised waistline and underlined skirt with invisible zipper closure and decorative buttons, contrast yoke front, bodice back and bands. 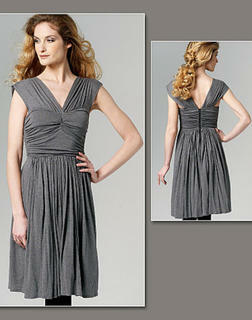 Back hemline extends to form train. 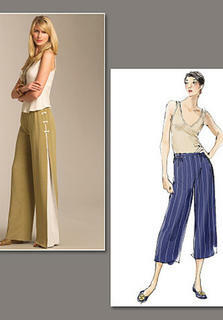 MISSES’ PANTS: Lower calf or full length pants A, B have slightly flared pant legs, waistband with elastic at sides and back zipper. 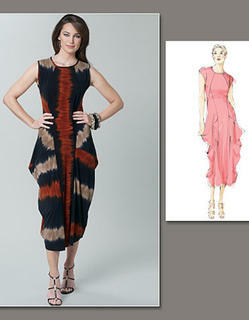 B: contrast pleat underlay at sides with or without contrast trim inserts. Optional side closures: tie ends, purchased frog closures or bar tacks. This pattern is a "Today's Fit" please use this sizing chart when choosing you size as it may differ from your normal one. 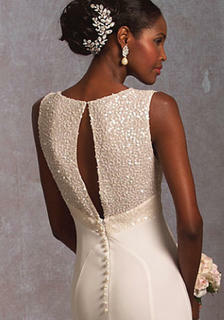 Bridal dress. 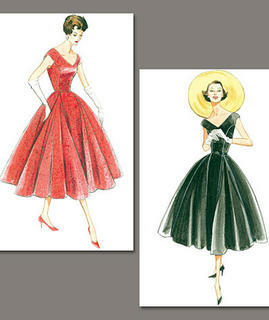 Lined, princess seamed, flared, floor length dress has underskirt (which is part of lining), fabric loops, buttons, invisible zipper closure and pleated ruffle with lace trim. Attached foundation has boning. Purchased petticoat. Semi-fitted, pullover tops A, B in two lengths have raglan sleeves shirred with elastic and two cowl variations, optional contrast cordless piping. Close-fitting, 1" seam pull-on pants C with side slits and elastic waist. All have stitched hems. Moderate stretch knits only. This pattern is a "Today's Fit" please use this sizing chart when choosing you size as it may differ from your normal one. Mizono Very loose-fitting. B: Inside ties, (wrong side on sleeve will show). 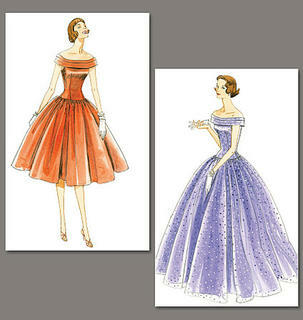 FABRICS: A, B: Linen, Broadcloth, Organza. MISSES' BLOUSE: Semi-fitted blouse. Shirred effect is caused by elastic sewn to seams. 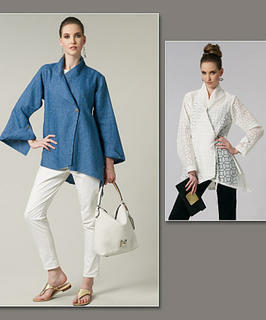 A,B: Optional trim or cording. A: Optional sleeve tabs. FABRICS: Broadcloth, Crepe, Lightweight Twill. This pattern is a "Today's Fit" please use this sizing chart when choosing you size as it may differ from your normal one. 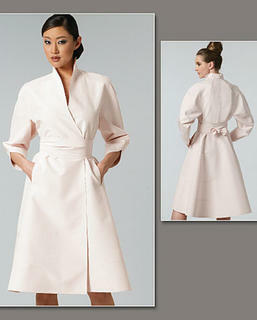 Very loose-fitting, lined coat has stand-up collar, yoke and dolman sleeves, bands, welt pockets, and inseam buttonholes. A: Elbow-length sleeves. B: Three-quarter sleeves. 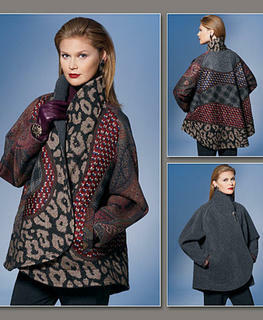 FABRICS: Lightweight Woolens, Melton, Fleece. Unsuitable for obvious diagonals.